An area has just been Paperized. Mario can then paste a Sticker from the album somewhere on the scene. Paperize (known as Paperise in Europe and Australia and also called Paperization or Paperisation) is one of Kersti's abilities in Paper Mario: Sticker Star. To perform the move, she stops time and flattens the visible area on-screen, turning it into a picture. 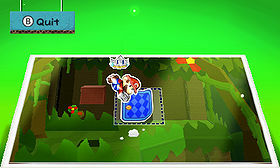 Mario, however, floats over the "picture", and he can choose stickers from his album to paste onto the scene. The sticker must be positioned, and after pasting it, Mario must smooth it out. He can then return to the newly altered scene. This ability is used extensively in the game to solve puzzles. Areas that are affected by placing items show a faint box or purple void where the item should be placed. When placing a small sticker in a ? Block with a pink flower and then hitting the block that appears will yield either a completely different or an upgraded sticker, making the Paperize ability useful for getting better stickers or stickers that Mario doesn't have yet. With certain stickers, there is a chance to get a block that yields three stickers instead of one. The ability can also be used to remove or replace objects in the environment, like the fountain in Decalburg. Objects that have been removed by Mario are saved in his sticker album as scraps, and a purple void is left where the object originally was. He can then paste the object back at any time. Areas that have removable objects will often show it by showing a peeled corner when Paperized. Several other characters, including Kamek and Bowser Jr., also have this ability. Mario must also use this power to retrieve Luigi from certain locations throughout the game. While Mario is traversing the Warm Fuzzy Plains, he encounters Bowser Jr. To impede Mario's progress, Bowser Jr. turns a nearby bridge into a sticker and throws it onto a high ledge that Mario cannot reach. With no way forward, Mario is forced to turn back. After enlisting the help of a few Toads, Mario retrieves the bridge; however, he needs to find a way to put it back where it was. Kersti then appears, suggesting Mario use the Paperize ability. Mario pastes the bridge back where it belongs, and continues on his way. This is the first time the ability is used. As stated before, the ability is later used extensively in the game as a means to solve puzzles and uncover secrets. This ability could possibly be a form of breaking the fourth wall, as the area paperized is invariably the exact image seen on the Nintendo 3DS itself. This ability cannot be used while Mario is seperated from Kersti in Rustle Burrow and Rumble Volcano. This page was last edited on March 23, 2019, at 10:43.